Would you like your doggy friend to live a healthy life? The one thing you can do is to feed your doggy friend the right food which is made of good-quality ingredients, has the right amount of macronutrients suited for your doggy friend and contains named meats. There are a lot of different brands of dog food available in the market and it can be hard for one to decide which is the best one to choose! In this blog post, I will help you buy the best dog food for Dachshunds and also go into a few things you should know about your dog’s nutritional needs. I feel that it is extremely important for a dog owner to know a few things about their dog’s breed as it is this knowledge that helps them take care of their doggy friend’s nutritional needs. 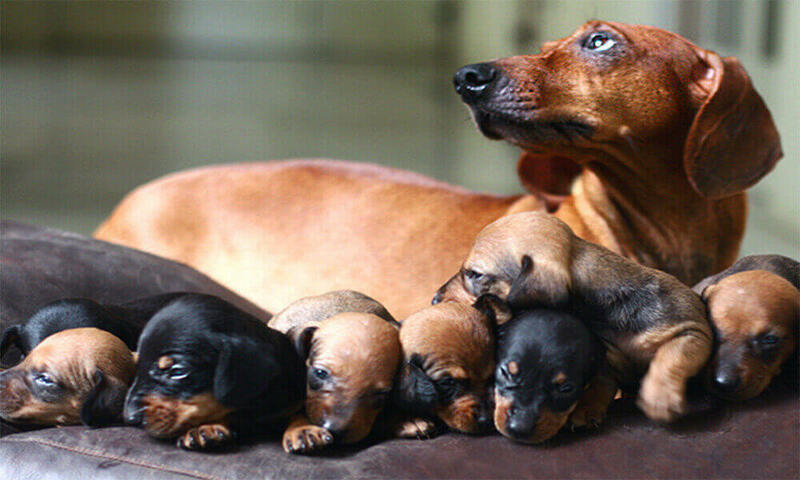 Did you know that Dachshunds come in three different sizes? Miniature: This dog is really tiny–about 5-6 inches tall and weighs only 11 pounds! Since the Dachshunds are a small breed, their nutritional needs are similar to those f the other toy breed or small breed dogs. Dachshunds need just the right balance between carbohydrates, fats, protein, and dietary fiber in order to get the best out of their foods. Keep in mind that these are just the recommended minimum quantities of the said macronutrients. That being said, the fat to protein ration must, ideally be a little bit higher and must be tweaked according to the lifestyle the dog lives. An active dog will need more of these nutrients in order to compensate for the extra calories burnt. A less active or senior doggy will need a lower proportion as they aren’t as active. One thing that I would like you to know is that you must talk to your vet before making any tweaks or adjustments to your dog’s diet! It can be a difficult task to find the best dog food for Dachshunds. After all, you need to pick a dog food that is made with good-quality ingredients, contains named meats, has the right balance of macronutrients, and is something that your dog actually likes. In this section, I’ll review some of the best dog foods for this breed. Let’s talk about each of these dog foods in detail, shall we? When we make an assessment of the Royal Canin Breed Health Nutrition dog food by looking at just the quality of ingredients used, it comes out to be an above-average kibble. Your dog would love the flavor of this dog food as its aroma helps stimulate the dog’s appetite. This dog food also contains a moderate amount of meat content in it, making it a good pick for your Dachshund. One of the biggest flaws with this dog food is that it contains corn which is a low-grade ingredient. Some dog owners have also complained about their doggy friends getting allergic reactions to this dog food. While assessing the Eukanuba Adult Dry Dog Food by the quality of ingredients used, it comes out to be an average kibble. This dog food has been designed specifically to cater to the high metabolism of the toy breeds and also offers a specialized fiber system which helps in the promotion of nutrient absorption and aids in digestion. This dog food has been enriched with chondroitin and glucosamine for healthy joints and it also contains omega-3 and omega-6 fatty acids. This dog food is also known to contain a moderate amount of meat which is also an amazing thing. This dog food can cause your Dachshund to have an upset stomach and other digestive issues. This dog food also contains a low-grade ingredient; corn. When we were assessing this dog food on the basis of the quality of ingredients used to make it, we were able to come to the conclusion that this is an above-average kibble. This dog food is grain-free and proves to be a complete and balanced meal for your doggy friend. Rich in protein, it is made from the best quality ingredients and contains premium meats in order to meet the high metabolic needs of the small breed dogs. This dog food is all-natural and doesn’t contain low-grade ingredients such as corn, wheat, soy, etc. and is made in the United States of America! Wellness CORE is also known to contain a significant amount of meat in it–which is an amazing thing. This dog food is known to cause digestive issues in certain dogs as well as causes allergic reactions like rashes, dry skin, etc. When assessing the Blue Life Protection Formula Adult Dry Dog Food by just the quality of ingredients, it comes out to be an above-average dog food. This kibble contains de-boned chicken which is rich in protein and contains no chicken by-products. It also contains a mixture of garden vegetables, whole grains, and fruit. The thing to note is that this dog food contains no filler and low-grade ingredients such as corn, soy, etc. and also contains no preservatives, artificial flavors, and other bad things! It is also known that this dog food has a moderate amount of meat. This dog food is known to be inconsistent in different batches and is also known to cause digestive issues and an upset stomach in dogs. While only looking at the quality of ingredients used to make the Orijen Original Dry Dog Food, we can determine its an above-average kibble. This dog food is known to have a healthy balance of meat, fruits, and vegetables for dogs and contains 80% meat and the rest 20% is fruits and veggies. The thing to note is that this kibble contains no grains. This kibble is known to clearly contain an abundant amount of meat in it, which is amazing! Several dog owners have stepped up to share that this kibble made their dogs sick. I sincerely hope that this blog post helped you figure out the best dog food for Dachshunds. I would highly recommend that you consult your vet before making any changes to your dog’s diet as your vet knows more about your dog’s health and well being and will be able to give you proper advice. Still, got any questions or concerns? Share them with us in the comments section and we’ll get back to you as soon as we can!